The best Philadelphia ice cream - Bassetts Ice Cream in Reading Terminal Market. (Yes, there is no apostrophe, it's just "Bassetts".) It has been there in its exact location, since the Civil War. To better view this photo, just click directly on it to enlarge it. The nation's birthplace, regrettably, can be hot and humid in summer. But these Philadelphia ice cream establishments are great places to visit, all year long. 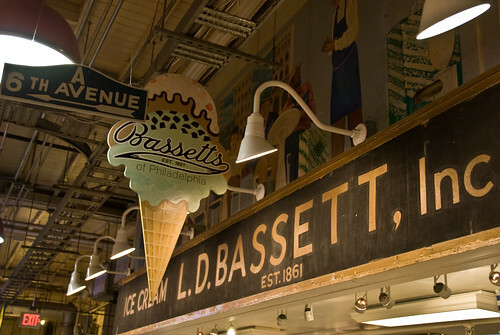 1) Bassetts Ice Cream, in the Reading Terminal Market, it's directly adjacent to Market East Station. The oldest, most successful, and best ice cream in Philadelphia, without a doubt. In business since Abraham Lincoln was in the White House, its long and colorful history means that you're stopping at a seemingly immortal Philadelphia purveyor. The milkshakes, in particular, are highly recommended. And if you're in town in autumn or winter, make sure you try the pumpkin ice cream, or a blend of pumpkin and cinnamon ice cream in your shake. 1734 Chestnut Street - Chestnut Street between 17th and 18th Streets, south side of Chestnut. You may find Scoop de Ville difficult to find, because the exterior sign features Maron Chocolates more prominently. And the ice cream is good, too. Be prepared to wait, as when we were there recently, it was quite crowded. But they have formal, laminated menus with helpful suggestions as to what you might want to try, out of their many concoctions. Maron Chocolates claims to be even older than Bassetts, as their stationery reads "since 1850". 119 S. 13th Street, right next to Philadelphia City Hall, which is at Broad and Market Streets. Its second location is at 117 S. 20th Street, located just off Rittenhouse Square - a beautifully scenic place. If you are on that side of Broad Street, we recommend trying the strawberries and cream, and pineapple, combination together, especially on a hot day or evening. You can then either sit in Capogiro's outdoor seating area, or take the gelato to Rittenhouse Square and eat there. You can easily get to Scoop de Ville, as well as the Rittenhouse Square location of Capogiro's, by taking SEPTA Regional Rail to Suburban Station located at 16th Street and John F. Kennedy Boulevard. From Suburban, it's a short walk to Chestnut, where Scoop de Ville is. The Rittenhouse Square location of Capogiro's is somewhat further, in that you have to head west on Market Street till you get to 20th Street, where you turn left and follow down about 1 1/2 blocks. But if it's a nice day, it's an easy walk. 229 Market Street - on Market between 2nd and 3rd Streets. In the heart of Old City is where you'll find Bon Bon. On the north side of Market, it is a great place to visit when you are coming to or from any of the nearby major historic Philadelphia attractions, such as the Liberty Bell, Independence Hall, or the National Constitution Center. If you'd like to leave Philadelphia Ice Cream and return to the Home Page of Enjoying Philadelphia, please click here.